It’s a strange day when a straight man takes credit for marriage equality in Maryland but Ben Jealous is that guy. I’m certainly happy that the NAACP moved to endorse marriage equality on his watch. It was a good decision and showed leadership. But it is a far cry from claiming to be the critical guy who made marriage equality happen. When it comes to his being “indispensable” on marriage equality, however, Jealous and his campaign have been categorically unable and unwilling to provide any evidence to back up the claims of the editorial. Personally, I preferred the Taylor Swift version of his reply. But again, it’s revealing. Rather than answer the hard-hitting question, he attacks the questioner. 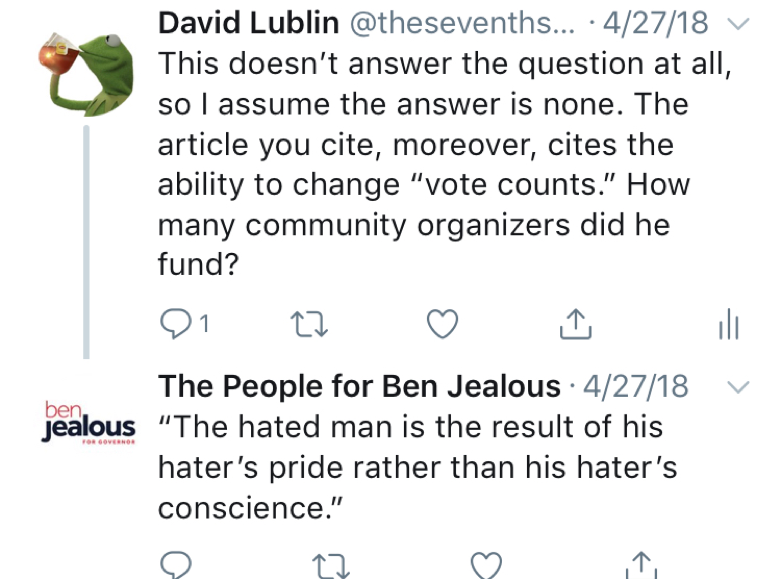 It takes a certain amount of chutzpah to accuse me of “pride” when he’s the guy claiming to have gotten marriage equality and numerous other legislative initiatives done. So ultimately, beyond the editorial and the nice quote from Martin O’Malley of the sort that politicians tend to give when asked about someone receiving an award, we’re left with a whole lot of bupkis for evidence. As someone who was actively part of Equality Maryland’s legislative lobbying team and Co-President of Equality Maryland during the referendum fight, I have some knowledge on the question. Jealous never showed up at any of the strategy sessions held with key legislators that I attended. Jealous was certainly never mentioned when it came to recruiting key votes on the issues. Carrie Evans, the Executive Director of Equality Maryland, played a key role in recruiting at least one Republican to a yes vote. Rep. Jamie Raskin, then a state senator, played a similar role in wooing the vote of a colleague on the fence. Most importantly, I know that Sen. Rich Madaleno, who I support, spent years indefatigably working on this issue long before it was fashionable. As part of a long-term strategy, he built legislative capital and support to get the bill on the floor and passed. 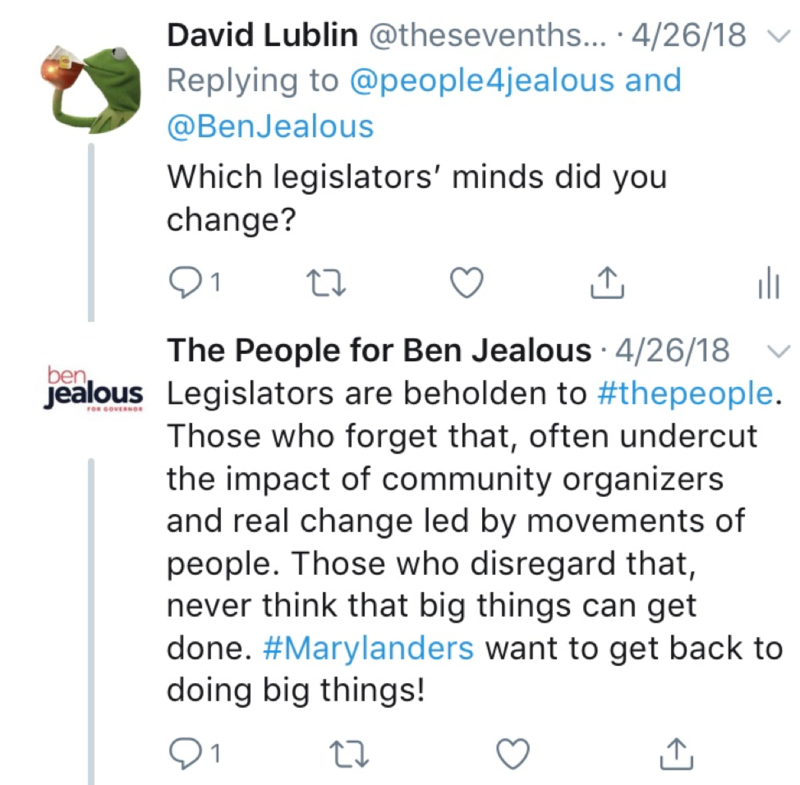 So many outsider candidates like to denigrate Annapolis politics, yet how do they think bills become laws and why then are they running for office? None of the leaders of Equality Maryland, or any other incredibly kind and giving people who worked hard on the bill, have ever claimed to have been the key person in getting marriage equality accomplished. While I feel I did my bit, I also know that many were on the scene long before I arrived and also personally saw the self-effacing involvement of many good people. One example I remember often is that of Del. Ben Barnes. He carried the bill for years in the House before it had a real chance of becoming law. Nevertheless, when asked to step aside for other sponsors in order to help advance the bill, he did so without any hesitation whatsoever. That’s someone who will never get much public credit but deserves it. The late Sen. Gwendolyn Britt similarly sponsored the bill in the Senate until she passed. I do want to thank two straight African-American men for their incredibly helpful support: President Barack Obama and the late former NAACP President Julian Bond. President Obama’s timely evolution on the issue in advance of his own 2012 reelection bid created a critical and noticeable bump in the polls among African-American voters. When I asked Julian Bond if he’d be willing to appear in pro-marriage ads (he had the office next door to me at AU), he said yes immediately. I’ve also never seen anyone look so embarrassed when I thanked him in his office just before I got legally married. UDDATE: Venue changed due to school closings. 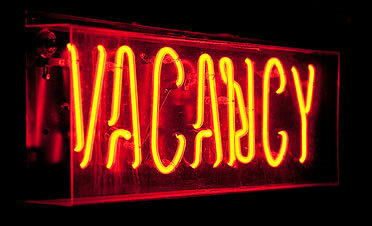 Now at Jane E. Lawton Community Center at 4801 Willow La., Chevy Chase. 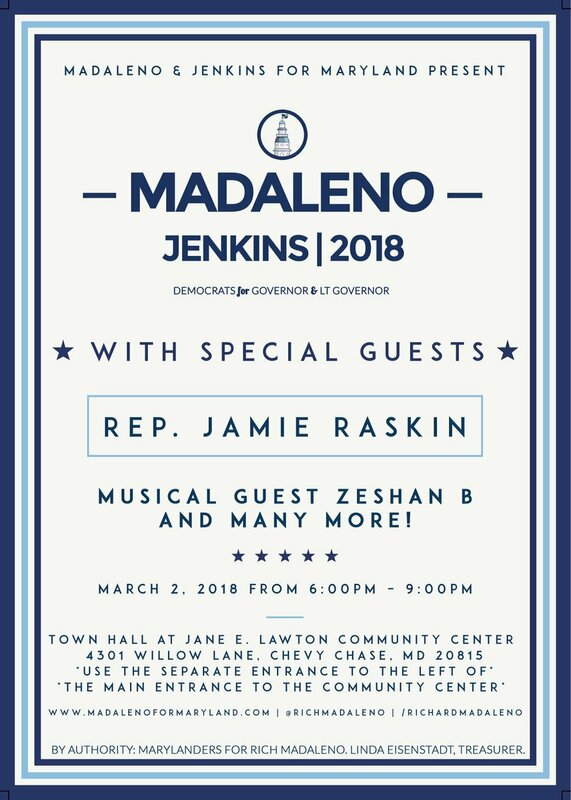 Rep. Jamie Raskin (D-8), a progressive icon in Montgomery County, is set to endorse Sen. Rich Madaleno (D-18) at a rally tomorrow in Silver Spring. Raskin will be among over 20 current or former state and Montgomery County officials set to endorse Madaleno. The battle to replace Jamie Raskin in the State Senate is currently the object of much speculation but the logical and likely appointment by the Montgomery County Democratic Central Committee (MCDCC) seems obvious: Del. Will Smith. All three sitting Montgomery senators who gained that office via appointment were already delegates: Craig Zucker in District 14, Brian Feldman in District 15, Nancy King in District 39. Each had served at least one full term in the House before moving to the Senate. Beyond experience, selection of a delegate also make sense because the exact same constituency has already elected them to the General Assembly. The three delegates are not just the most obvious but most democratic choices. Among the three delegates, Del. Sheila Hixson could have it if she wanted it but doesn’t. That leaves Del. David Moon and Del. Will Smith. Both are former campaign managers for Sen. Jamie Raskin’s past campaigns and won election in 2014. Prior to their election, highly diverse District 20 had an all white state legislative delegation. The election of Korean American Moon and African American Smith changed that. Beyond personal ties, Sen. Raskin and Del. Hixon’s desire to diversify the delegation no doubt played a role in their joint endorsements of Moon and Smith. The Montgomery County Democratic Party remains interested in promoting greater racial diversity in the delegation. MCDCC will be under enormous pressure to take this into account during its deliberations. This factor weighs heavily against David Moon. No African American has ever won election or appointment to the Senate from Montgomery County. According to the Census, African Americans now form roughly 19% of the County’s population. In contrast, there is currently one Asian American Senator–District 16 Sen. Susan Lee. She forms one of eight, or 12.5%, of the Montgomery County Senate delegation–not far off the estimated 15% of the County’s population that is Asian American. There are currently three African Americans (Dels. Al Carr, Pam Queen and Will Smith) and four Asian Americans (Dels. Kumar Barve, Aruna Miller and David Moon along with Sen. Susan Lee) in the entire Montgomery state legislative delegation, so African Americans have less overall representation in terms of absolute numbers and percentages. David Moon has advocated for increased minority representation in the General Assembly. He has promoted minority candidates and helped to pass along his considerable campaign skills. Nonetheless, the logic of these very ideas will work against him in a jurisdiction and party attuned to racial balance, especially since District 20 has the highest share of African Americans in the County. Other African Americans have thrown their hat into the ring, notably former County Councilmember Valerie Ervin and Will Jawando. Both are well qualified but have political strikes against them that mitigate against an appointment over Smith. Ervin has touted that her appointment would be a double win, as her appointment would bring the share of women in the Senate delegation to parity. However, she abandoned her seat on the County Council before the end of her term to take up another job, which annoyed many activists. Additionally, Ervin supported Edwards for Senate–not the popular position in Montgomery. While this is not nearly as problematic as her resignation, Ervin’s quotes in the media expressing ambivalence about endorsing Van Hollen in the immediate aftermath of the election are much more damaging. Jawando faces an uphill climb for different reasons. Smith beat him for a delegate seat in 2014. Why should MCDCC second guess the choice of the voters? Second, after losing that race, he made a quixotic bid for the congressional seat against Raskin. If Jawando had supported Raskin, he would have been very well positioned for the delegate seat. Opposing Raskin, who has long had very strong support among this same constituency, has made winning that seat far more difficult, especially since he received even fewer votes in his congressional bid than his delegate race. A guest blog by Adam Pagnucco. Let’s put together the previous three parts and look in detail at the strengths and weaknesses of the top three candidates. The above areas illustrating Raskin’s greatest strengths have something in common: they are all totally or primarily inside the Beltway. (Most of the portion of Council District 1 that is outside the Beltway is in Congressional District 6.) The areas showing his greatest weaknesses also have something in common: they are all totally or primarily outside the Beltway, some of them a considerable distance outside. Raskin expanded his geographic base successfully since 74% of his votes came from outside District 20, but his votes began to dry out north of Norbeck Road. His 6.5 point victory was due to his ability to consolidate the vote in Downcounty precincts while pulling just enough votes from the north to prevent David Trone or Kathleen Matthews from winning. Trone’s strengths and weaknesses are the mirror image of Raskin’s. He lost to both Raskin and Matthews inside the Beltway, but as the precincts went farther north, Trone got stronger. Trone’s success in the northern Counties as well as Upcounty Montgomery will no doubt cause him to take a hard look at the Congressional District 6 seat should John Delaney run for Governor. Western Maryland accounts for a fifth of CD8’s Democratic primary voters, but in CD6, it accounted for roughly 40% of the vote in both the 2016 and 2014 Democratic primaries. One interesting thing not shown here: Trone was the leader in majority-minority, heavily Hispanic and heavily Asian precincts. Matthews finished second in most parts of CD8, which isn’t bad, but she finished first in just two local areas: Leisure World and Derwood, which has only one precinct in the district. If she had also finished first in, say, Bethesda and Chevy Chase, she might have gotten close, but Raskin owned the areas inside the Beltway. Matthews told the Washington Post that she was thinking of running for local office in the future. Here’s an idea for her: in a County Council at-large race, the top four vote-getters triumph. A candidate who finishes second everywhere would be a lock to win. Now here’s an interesting thought. With Raskin going to Congress, Matthews thinking about running again and Trone not ruling it out either, could all three of them ultimately be in office after the next election? The data below combines precinct information with census tract data on Hispanic origin and race from the 2010 Decennial Census. The demographics of the three counties are very different. Of the 67 precincts in Carroll and Frederick Counties, 63 had populations that were at least 90% white. Of the 139 precincts in Montgomery County, 57 were majority-minority. These differences influence the presentation below. Here are the results for precincts by their population percentages in different demographic categories. At first glance, the data shows a seeming contradiction. Trone led in precincts with populations over 75% white. But Trone also led in precincts with less than 40% white populations. How can this be? The former fact is explained by Trone’s victory in the overwhelmingly white precincts of Carroll and Frederick. The latter fact is explained by Trone’s wins in Gaithersburg, Glenmont/Norbeck and parts of Rockville, which are racially diverse. Trone also finished a close second in Wheaton and Silver Spring East County. While Senator Jamie Raskin won big in diverse precincts in Takoma Park and Silver Spring Inside the Beltway, he also won in predominantly white Bethesda, Cabin John, Chevy Chase and Kensington. Delegate Ana Sol Gutierrez was a factor in Glenmont/Norbeck (Zip Code 20906 excluding Leisure World), finishing second in the nine precincts there. She finished third in the 19 precincts with at least 33% Hispanic populations. We will have a summary of the candidates’ performance in Part Four. It’s time to dig deeper on geography. Below are election day results for every state legislative district overlapping with Congressional District 8. Of the twelve legislative districts sharing precincts with CD8, David Trone won nine of them. Predictably, he won the five legislative districts in Carroll and Frederick Counties, and he got majorities in three of them. He also won the precincts in Districts 14, 15, 17 and 19. Senator Jamie Raskin won the precincts in Districts 16, 18 and 20, but those three accounted for 58% of election day votes. No other candidates won any legislative districts. A note about District 20, Raskin’s home base. He received 52% of its votes, which was a lower percentage than Trone received in three northern legislative districts. Seventy-four percent of Raskin’s election day votes came from outside District 20, meaning that he succeeded in diversifying his geographic base – primarily to other precincts inside the Beltway. Raskin received more votes from District 16 than from District 20. Here are the same results for county districts. Again, Trone won every county district in Carroll and Frederick. But he also won the precincts in Montgomery County Council Districts 2, 3 and 4. Raskin won the precincts in Montgomery County Council Districts 1 and 5, and those two districts accounted for 54% of election day votes. Here are the results for towns in Carroll and Frederick Counties. Trone got a clean sweep here with one exception: in one precinct in Knoxville (Frederick County), one vote was cast and it went to Delegate Ana Sol Gutierrez. In every other case, the rank order was Trone first, Matthews second and Raskin third. Now here are the results for towns in Montgomery County. Wheaton is defined as Zip Code 20902. Glenmont/Norbeck is defined as Zip Code 20906 except for Leisure World, which is separated out. Silver Spring (East County) is defined as Silver Spring precincts not in Zip Codes 20902 or 20906 and located outside the Beltway. These results are much more diverse. Of the fifteen towns in Montgomery, Raskin won eight: Bethesda, Cabin John, Chevy Chase, Kensington, Silver Spring (East County), Silver Spring (Inside the Beltway), Takoma Park and Wheaton. No other candidate won a town inside the Beltway. Kathleen Matthews won Leisure World and Derwood, which had just one precinct. Trone won Damascus, Gaithersburg, Glenmont/Norbeck, Potomac and Rockville. Delegate Ana Sol Gutierrez finished second in Glenmont/Norbeck, an area with a substantial Latino population. The local data in Montgomery supports the narrative that Raskin’s victory was supported primarily by Inside the Beltway voters, and he rounded up enough votes from other places to prevent either Trone or Matthews from breaking through. We will look at precinct demographics in Part Three. It has been roughly three weeks since Maryland’s primary election on April 26 and most of the results are in. All jurisdictions have reported returns from early voting, election day, absentee ballots and provisional ballots and unofficial precinct-level data files have been released. While the City of Baltimore’s results have some problems, they are not relevant to Congressional District 8. The time for a data crunch has arrived. First, let’s examine the overall results. Senator Jamie Raskin was the leader in early votes, election day votes and absentee and provisional ballots, but his leads were of different magnitudes. Raskin won early votes by 16.1 points, a far larger margin than his wins in absentee and provisional votes (7 points), total votes (6.5 points) and election day votes (3.5 points). As we proceed to analyze precinct votes on election day, let’s recognize that they underrate Raskin’s strength relative to the total vote count. Here are total votes and election day votes by county for the top six candidates. David Trone won an absolute majority of both total votes and election day votes in Carroll and Frederick Counties, but they comprised about a fifth of the electorate. Raskin won Montgomery County by 13.7% in total votes and 12.3% on election day. Kathleen Matthews placed second in all three counties. This partially obscures the story of geography at a macro level. Consider the following three areas: precincts inside the Beltway, precincts outside the Beltway and still in Montgomery, and Carroll and Frederick together. Raskin won the Inside the Beltway precincts by 23.7% over Matthews, and since these are just election day votes, that probably understates his margin. But in the Outside the Beltway Montgomery precincts, Raskin and Trone were basically tied while Trone won the northern counties handily. Interestingly, more Montgomery County votes came from outside the Beltway than inside, but because Raskin had such huge support from inside precincts, he was able to withstand his opponents’ performance in other areas. We will have a finer cut on geography in Part Two.